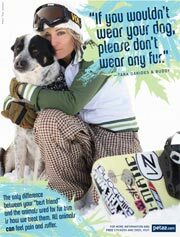 Tara Dakides Encourages you to take the "Fur Free Pledge"
Tara Dakides is the queen bee when it comes to freestyle snowboarding. Tara has taken home medals from the most elite competitions in the world of extreme sports—the U.S. Open, the Vans Triple Crown, and the Vans Cup, not to mention scoring gold numerous times at the X Games. Recently Tara, a.k.a. “The Terrorizer,” was awesome enough to take time out of her crazy-busy schedule to jump on board with peta2’s “If You Wouldn’t Wear Your Dog, Please Don’t Wear Any Fur” campaign. Tara, who is sponsored by Vans, Billabong, and Active, to name just a few, recently told the folks at peta2, “I just have no idea why anyone would want to wear fur or fur trim when there are so many alternatives. The animals used for fur are just as capable of suffering as any dog or cat.” It’s obvious that when snuggling up with her number one fan—her dog, Buddy—Tara clearly gets the link between animals used for fur and those we call our best friends. And visit her site here.